Iran Deal Looks Like A Done Deal, So Here Are The Next Crises For Congress : It's All Politics President Obama may have secured enough votes to keep his Iran deal intact, but potential problems loom for Congress on the debt ceiling, highway funding and a possible government shutdown. 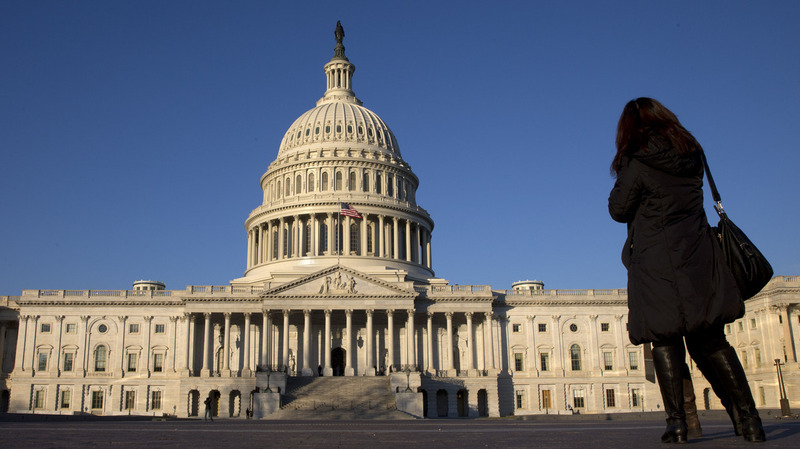 A woman looks on at the U.S. Capitol in 2013 after the most recent government shutdown. Congress has made no progress toward avoiding a government shutdown when it will run out of funding Sept. 30. Now that 34 senators have committed to support President Obama on the Iran nuclear agreement, that deal looks certain to survive the opposition of Republicans in Congress. In addition to the Iran deal, Congress must find a way to fund the government in the new fiscal year, which begins in just four weeks (Oct. 1). Threats abound to block that funding and force a shutdown, and issues as contentious as abortion, national security and the Confederate flag must somehow be resolved — or evaded. Beyond that, the federal debt is once again nudging up against the most recent limit set by Congress. The Treasury Department now says it will hit the wall in November or December. Without a higher limit, Treasury says, it will not be able to meet the nation's obligations to creditors. Disapproval of the president's Iran deal was thought to be the first item of business on Congress' agenda after five weeks off. But with the president securing enough votes from Democrats for the Iran deal to appear to be in tact, Congress next faces a host of other items. The government will run out of funding Oct. 1, raising the possibility of a government shutdown. There are thorny issues in the heat of a presidential campaign that have to get settled, such as funding for Planned Parenthood. The nation's debt limit will have to raised again, the Treasury Department says, by November or December, or the country could default on its debts. The authorization for the Export-Import Bank, which backs American companies overseas, was not renewed. It could be included in a grand package to avoid a shutdown. The highway fund is set to run out of money this fall. It has been replenished in a temporary fashion over the past several years. And around that same time, the highway fund that pays for roads and bridges will see its authority expire as well. So Congress should offer us all enough suspense this month, even without a cliffhanger on the foreign-policy front. The Iran issue will still be the first order of business, as a deadline looms on Sept. 17. Both chambers will debate the complex agreement, and a vote to disapprove the deal is sure to pass the House. In the Senate, however, that same measure is likely to be filibustered. Even though the outcome now seems a foregone conclusion, the Iran debate will still have to happen. It will take days. Congress will also lose two days of work to the Jewish high holidays of Yom Kippur and Rosh Hashanah and a third to the visit of Pope Francis. Every day counts, because Congress is woefully behind in its most important work — enacting the annual spending bills that keep the government functioning. Usually, by September, Congress has passed at least some of the appropriations bills needed to keep the government operating. This year, not one of the dozen bills has even received a vote on the floor of the House or Senate. Unless something is done to break this logjam, federal spending authority will simply end with the fiscal year — as it did for several weeks in 2013 and in 1995 and 1996. In each of the earlier instances, Republicans in Congress were at loggerheads with a Democrat in the White House. Government shutdown? Senate Majority Leader Mitch McConnell, R-Ky., has pledged to prevent any such thing. House Speaker John Boehner has said the same. But so far at least, no visible progress has been made in dismantling the roadblocks. In the House, a fracas over Confederate flags flown in cemeteries on federal park land has paralyzed the process. Also looming is a Democratic demand that the spending caps installed in 2013 be lifted — not just for defense but for domestic programs as well. Moreover, Sen. Ted Cruz of Texas and his allies in both chambers said they will block any spending bill that does not defund Planned Parenthood. The White House has said it will not sign any bill that does. Cruz and others tried to defund Planned Parenthood directly in July, after controversial videotapes emerged showing officials of that organization discussing the treatment of fetal tissue from abortions. Federal money cannot pay for abortions, but hundreds of millions of dollars go to Planned Parenthood to pay for other medical services every year. In the past, Congress often raised the limit on the national debt routinely as part of the budget process. But Republicans in the majority have made this a separate and highly featured vote. It is possible it could be included in the larger negotiations for a budget deal this month. Some have also argued for a longer extension of the highway fund's authority, or a restoration of the charter of the Export-Import Bank, as part of these same negotiations. The Ex-Im Bank charter lapsed over the summer because many House Republicans oppose it. House and Senate GOP leaders, however, have vowed to find a way to bring it back. Adding such thorny matters to a "must pass" bill is a time-tested technique for congressional leaders in both parties. But when the must-pass bill gets bogged down on its own, adding extra burdens may be the last thing those leaders want to do. So stay tuned. Once Congress gets past the Iran deal, the Jewish holidays and the pope, it will have just about a week to fashion a mega-deal accomplishing most of its work for the year.